The Kakaxi device uses sensor technology to capture and broadcast accurate, hyper-local weather data. The device uses an ultra-wide camera to capture time-lapse video of food growth, is solar powered, and connected by 3G. Easy to read graphs detail on-farm conditions via Farmer Dashboard accessible by smartphone or computer. From the potato chip aisle to five-star cuisine, more people want to know where their food comes from. Kakaxi is the ultimate tool for farm to table transparency. The device transmits visual data of environmental conditions and time-lapse footage showcasing the story of food. The maintenance free Kakaxi device is powered entirely by the sun and is the first autonomous farm-monitoring system that pairs weather data with matching imagery of food growth. Simply open the box and place the device in the field to begin collecting data and recording. 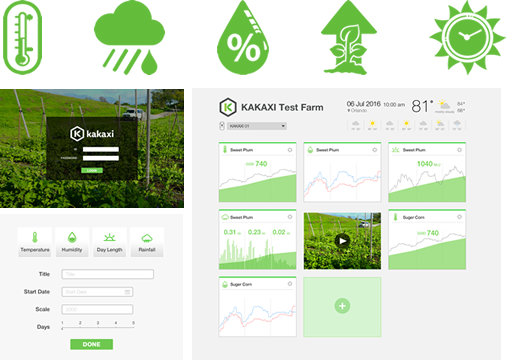 Kakaxi is the most affordable device for farm monitoring and marketing. We are leasing device units in order to provide subscribers with the most up to date versions as technology evolves. No installation fee, no annual contract, no up front payment for device. We provide software updates and if you have trouble with device we will send a new one to you at no cost. 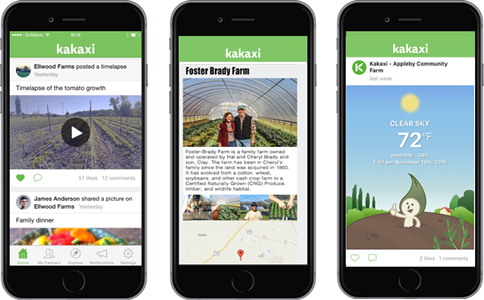 Breaking from the modern perception of food as a commodity, KAKAXI strives to connect farmers with consumers to help bring the story behind our food to the table. By building value and community around our food, KAKAXI will nurture an appreciation for sustainable farming in current and future generations.